Ethiopians began voting in legislative elections Sunday with little doubt that Prime Minister Meles Zenawi would extend his 19-year-old of sub-Saharan Africa's second most populous country. With the country's most charismatic opposition figure in prison and what rights groups have criticised as shrinking political freedom in recent years, the 55-year-old strongman seemed assured of being comfortably re-elected. Polling stations started opening at 6:00 am (0300 GMT) for the vast Horn of Africa nation's 32 million registered voters to elect the 547-strong lower House of Representatives, as well as regional councillors who in turn will pick the upper chamber of parliament. The opposition scored its best results in 2005 and alleged afterwards that Meles' regime stole the election, sparking violence that left 193 protesters and seven policemen dead. 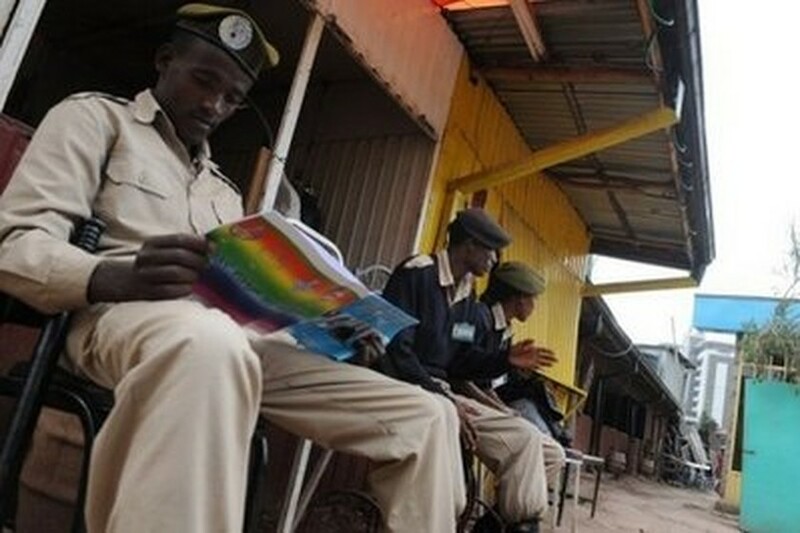 An Ethiopian police officer looks at election material outside a polling station in Addis Ababa. The ruling Ethiopian People's Revolutionary Democratic Front (EPRDF) has promised that the fourth multi-party legislative polls would be free and fair. But Human Rights Watch has charged that Meles has taken tough measures to avoid a repeat of the "mistakes" that nearly cost him victory in 2005. "The Ethiopian government is waging a coordinated and sustained attack on political opponents, journalists, and rights activists ahead of the May 2010 elections," the watchdog said in the run-up to the polls. Birtukan Mideksa, the 36-year-old woman who emerged from the 2005 electoral chaos as Ethiopia's most inspirational opposition figure, is serving a life sentence in jail. "In the true communist tradition, we fear that the government is seeking to weaken her in prison to ensure she no longer poses any political threat," Negasso Gidada, vice chairman of Birtukan's party, told AFP. Challenging Meles and his EPRDF will be the coalition Medrek ("forum" in Amharic). "If we win, we intend to form a national unity government for the five coming years," said Beyene Petros, the current rotating chairman of Medrek. Meles' regime faces a strong Medrek challenge in the southern Oromiya region, a rebellion in the Somali ethnic region of Ogaden and even unprecedented opposition in its own historical fiefdom of Tigray. But observers argue that the opposition, despite joining forces under the Medrek umbrella, remains weak and divided and has not recovered from the repression that followed the 2005 post-electoral unrest. "The leadership of the Forum rotates every few months, and even so, they lack the charisma of Birtukan and have not been able to capture the imagination of the citizens," an Addis Ababa University professor said on condition of anonymity. Foreign criticism of the regime's authoritarianism has been muted, notably because Meles -- whose country borders Eritrea and Somalia -- remains a key US and Western ally in the fight against Islamic extremism. "It's great thing if there are several opposition parties, but when it comes to the long-term stability of the country and the region, Meles is still your best bet," one Addis-based diplomat said.